Planning a wedding can be a pretty daunting task. It is a costly event but one that will be remembered for all your life. It is the one day where everyone you hold dear to you and your partner is all in one place, celebrating YOU. This is not something you can do over, no second chances. I am dedicated to you and preserving your memories from this day exactly how you remember them. You want a wedding photographer that will not only create beautiful photographs but have the process of creating those photos to be easy and fun. You value your time with your guests a bit more than taking portraits all day. You want to enjoy your wedding instead of making it into one big photoshoot. 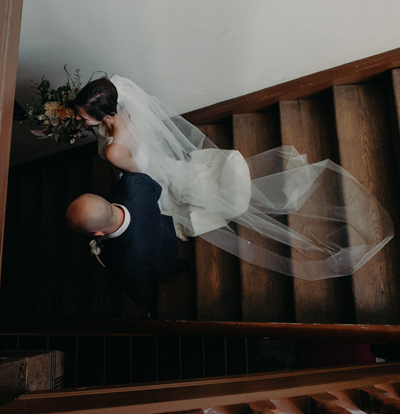 You want your wedding photographer to respond promptly to your emails and questions. All the photos you see on my website are REAL. There are no fake weddings here, no styled shoots, no professional models in ideal settings. For me, I want to work with people who hire me as an artist, who appreciate and trust my perspective. I want to work with couples that value their wedding photography and know that their wedding photos are one of the few tangible items from their wedding day. I'm doing so much more than just showing up on your wedding day to take pictures. I want to help you through the process of planning and making a timeline if you need it. I'm on your team and want the best for you! I do limit the amount of weddings I shoot per year to better serve the clients I do have. Wedding collections start at $3200 and include hourly coverage, a USB of edited images, and an online proofing gallery. Engagement sessions can be added onto any collection for free! Album collections and a la carte pricing is available. Travel for the wedding day is free to Milwaukee, Madison, and Sheboygan areas. Currently taking commissions for 2019 + 2020 weddings. Since every wedding is unique please contact me with info about your day and I can help you determine what package would best fit your needs. Lifestyle family sessions start at $495. Senior Portrait sessions start at $400. Please contact me for more portrait session info!